Homemade waffles are a staple at our house. My kids love them. I always make a big batch and freeze them. That way, they are really no different than the frozen waffles in a box. They are different in one way. My homemade waffles contain no refined sugars, no refined flours and no other strange ingredients. 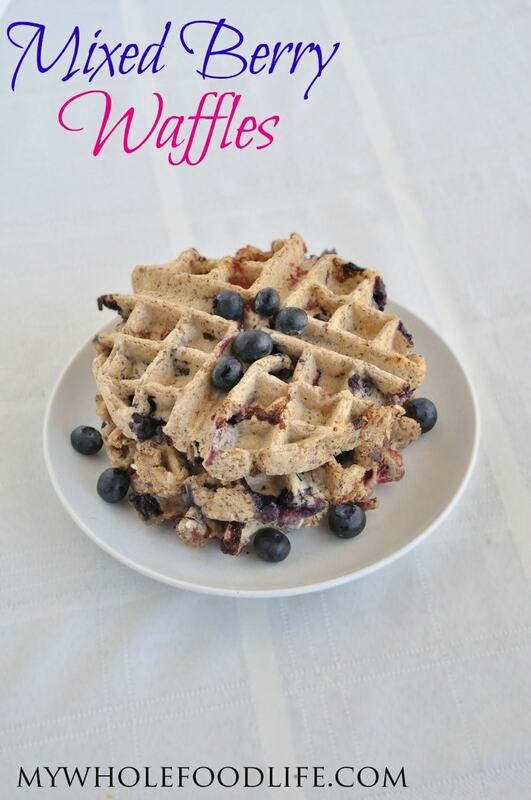 These Mixed Berry Waffles are perfect for spring. My kids just love fresh berries, so I knew these would be a hit. I was excited to test out my new waffle maker too. I was happy that it could make 2 waffles at at time! 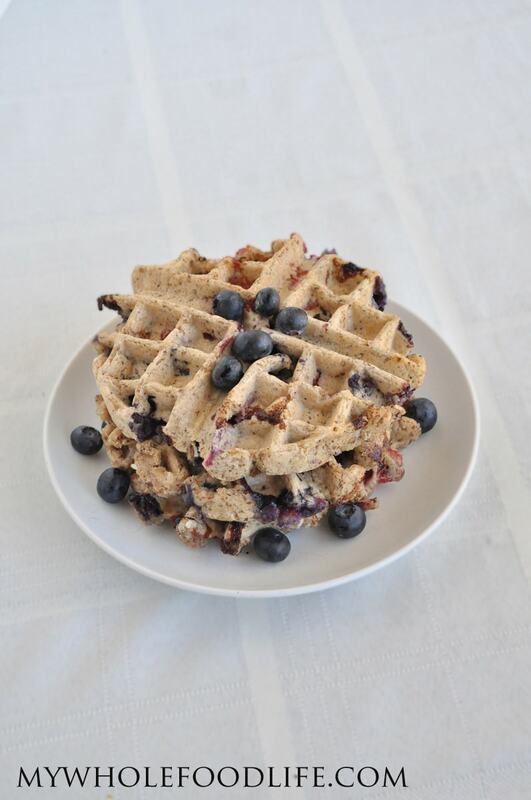 These mixed berry waffles are gluten free and vegan. 🙂 My kids just loved them and I hope you do as well. A healthy, make ahead breakfast your kids will love! In one bowl, mix all the dry ingredients. Cook the waffles according to your waffle maker's instructions. You most likely need to grease the waffle maker before making each waffle. You can serve immediately or freeze for later. These waffles should last a week in the fridge. You can also freeze them for longer storage. When storing, place a sheet of parchment in between each waffle so they don't stick together. Enjoy! Waffles are my favorite breakfast! I know I would love these... can't wait to give them a try! Do you know how many grams of carbs and sugar these have? thanks! hello. is there anything I can sub for the coconut? thanks. You can probably omit it and add some whole oats. Melissa, I've been trying to find a basic gluten free waffle/pancake recipe that I can add berries or not. Add pumpkin spice, or not, add enjoy life chips, or not etc...not too fond of a strong coconut taste so I will try it if it isn't too strong. Do you think this would work with 1/2 GF oats chopped up in processor and 1/2 of the coconut and/or add some flax? I'm trying to find something to stick to my son's belly so he's full for a while when he starts high school next year. He's an eating machine and loves waffles. It makes mornings easy for us too having them pre-made. Thanks always. Oh bummer. :( What kind of waffle maker do you have? I am glad you were able to salvage them! Hi! I noticed you changed waffle irons at some point. Any thoughts on the 2 models you've used? I'm interested in getting one, probably a lower priced like your old one, and would love your recommendation. The lower priced one works great. I just ended up getting the Belgain waffle maker to make pretty photographs. Awesome, thank you. I only found your blog about 2 months ago, on Pinterest, but I am just loving it. Thank you for sharing your expertise about food and equipment, and for helping the rest of us make eating whole foods convenient and delicious! You're welcome Sarah! Glad it was a hit! This looks like a great recipe. Can I take out the one cup of coconut and just make as is or would i have to substitute something else? My kids are not big coconut fans. TIA!! Thanks Bonnie! You can probably remove the coconut and add some oats?